GreenHeart Education is a primer on transformative education for sustainability. and your life's work as a teacher. It's all here, dedicated to all the children, of all species. "Humanity has pushed the world's climate system to the brink, leaving itself only scant time to act. We have five minutes before midnight." If you're like me, you are feeling a sense of responsibility for your students and their future. Scientists report that we only have a few years left to transform our society to a renewable energy (zero-carbon) economy to avoid catastrophic climate change. What is our role as educators in creating this transformation? At the appropriate grade levels, our students need to develop a deep bond with the rest of Nature, learn how life works on Earth, work together on creative solutions to environmental problems, and become practitioners of sustainable development if they are going to contribute to the necessary societal transformation. See Greening the Curriculum for a Green School Curriculum Map you can use. "The Sixth Extinction is the next annihilation of vast numbers of species. It is happening now, and we, the human race, are its cause." Whether you teach preschoolers, primary-aged children, middle schoolers or older students — and if you've been following the news — you know that education has to become part of the solution if humanity is to safeguard the future. How can our schools contribute in deeply meaningful ways? Think Gandhi's maxim: "Be the change you want to see in the world." Children learn what they live. Let's give them a place to "live" their school days that teaches them by example how to be stewards of the planet that sustains them. See School Greening. You might be feeling more than a little scared about a future defined by global warming, dwindling resources, war and injustice. Or perhaps you have a sense that what you're teaching is no longer relevant in light of 21st century realities. I know the curriculum where I live and work still doesn't mandate environmental education or education for sustainability. The powers-that-be keep tinkering with the curriculum — tweaking it without transforming it. This does not fill me with hope! If the "doom and gloom" has you feeling down, start envisioning — and then try to find ways to work towards — a zero-carbon future of safe, clean, healthy, peaceful and equitable renewable energy instead! Transformative education for sustainability can start with a simple change in our focus or context. What if everything we taught, we taught with the Earth, the future, and the children of all species in mind — and heart? See Transformative Tools for Sustainability Education. Again, if you're like me, you worry — in between the planning, the marking, the report cards and the little bit of time you have for yourself and your family — about what kind of world we're leaving for our students. If you have your own children, you're certainly concerned about them, and perhaps your grandchildren, as well. And what must our students be feeling these days? Our students need to know that the adults who care about them are doing all they can to protect the natural environment and safeguard the future for them. Plus, they need opportunities to take action, because action is our only hope. See Reasons for Greening Your Teaching. You care about children, so your reaction to everything you've been hearing and learning about climate change and other dire global issues is natural, and heartfelt. Because you care about kids, you care about their future, and the future of their planet. And you don't want to stick your head in the sand. If transformative education for sustainability resonates for you, it's probably because you don't want to teach for UNsustain-ability. But where to start? Right here! You'll find ideas, answers, support — a kind of online professional development — for greening the heart of your teaching. GreenHeart Education gives you a simple yet transformative model of education for sustainability, especially useful if you're just starting out on your greening journey, or doing it without the backing of your school community or educational jurisdiction. Even if you're not a teacher but simply a member of the human family who wants to put sustainability into action, you'll find lots of beyond-the-usual ideas for greening your world and worldview, as well as support for advocating a transformation to sustainability-centered education. And if you have questions or concerns, or ideas you'd like to share, please contact me. Though it wasn't called that way back then, I've been working at "greening the heart of education" and transformative education for sustainability for almost 25 years. So if you care about the future of our species, our home planet, and the rest of life on Earth, we are kindred spirits. Teaching for a healthy, green future — that's what education for sustainability is (I wish it were the purpose of all education!) — shouldn't be lonely and difficult, but it can be. Often, it takes courage and support to walk your own green path — to create your own gift to the future. GreenHeart will give you that support and encouragement. A weekly blog of ideas for radical and compassionate action on climate change.. This climate change primer gives teachers what they need to know about greenhouse gas pollution, and offers resources for teaching it. School greening means transforming your students' education, making sustainability the focus of curriculum and professional development, facilities and operations, and organizational behaviour. Greening the curriculum (using this green school curriculum model) creates graduates who are ready to tackle 21st century challenges such as climate change. Greening school facilities is imperative because our students learn what they live. They should spend their learning time surrounded by energy efficiency indoors and naturalized playgrounds outdoors. Greening school behaviour means applying an environmental / sustainability ethic to all decisions we make within our school community. Educators seeking reasons for greening their teaching will find a transformative, solid and salient rationale here. Integration of sustainability learning into the rest of the curriculum is an ecological teaching tool that counters the dangers of reductionism. 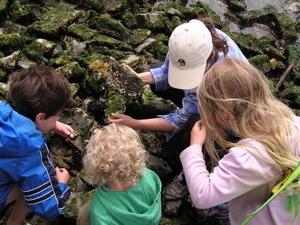 Transformative Nature study is experiential learning about organisms and natural objects, especially their origins and interrelationships, that helps students make friends with the rest of Nature. School gardens are a great way to use the schoolyard as a classroom, reconnect students with the natural world, and teach them valuable food production skills that integrate with several subjects. Green schools are vegetarian schools. Meat at school is no longer cool because it contributes to global warming and climate change. So many environmental efforts are aimed at individuals, but isn't the family a primary unit of change in our society? Sustainable family development helps families develop "green" competencies. Saying grace together at mealtimes is an excellent way to "practise gratitude" and grow closer together as a family or a class, in a way that teaches children where their food comes from. Prayers for the Earth is a collection of graces and prayers from different cultures and religions around the world, as well as prayers to heal the oil spill. Child Honouring is a philosophy and way of life that puts care and concern for our children at the centre of all our decisions and everything we do personally and as a society. 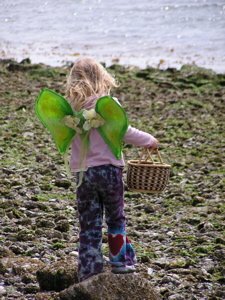 Greening early childhood education (ECE) means giving preschoolers the gift of Nature. Postsecondary sustainability education can start in every lecture theatre and lab, with every professor and instructor. 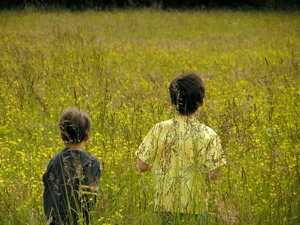 Greening homeschooling means allowing Nature to be a teacher in your child's education. Educational solutions are not enough. Our economic system needs transforming, and our political systems need to be reminded that future generations matter. Describes a master's in adult education thesis entitled Sustainable Development Learning as Enticement to Environmental Action. The many barriers that keep adults from environmental learning and action can be categorized as cultural, psychosocial, adult learning, and environmental adult education barriers. Enticements to sustainability are the cultural, psychosocial and educational ways to inspire and motivate environmental learning and action. A list of the references for a literature review on barriers and enticements to environmental learning and action, as part of a master's degree in (environmental) adult education. GreenHeart Education's About Us page introduces Julie Johnston and Peter Carter, a teacher and a doctor, who together have over 35 years experience in the environmental / sustainability field. How do we green the heart of education? Here is a list of GreenHeart Education services that we offer. Here is a sampling of GreenHeart Education testimonials – kind things that wonderful people have said about us – to show you how we can help you meet your goal of greening the heart of education. Use this page to contact us at GreenHeart Education. Transformative environmental and sustainability education - ideas, experiences, steps to take for greening the heart of your teaching.